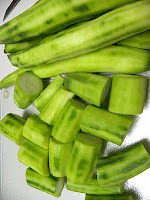 Turia is a famous Indian vegetable available all over India. Here in the States my mother-in-law grows plenty in her garden. It is amazing that none of these Turia come out bitter in taste. Because Turia tend to be bitter sometimes, it is a good idea to cut a little slit and taste them before cooking. Turia is also called a luffa squash. It is known as Luffa aegyptiaca. It is used as scrubber and sponge. It is famously know as Ridge Gourd because of its ridges. It is very rich in calcium, phosphorus and iron. Wash Turia thoroughly. As I mentioned above, make a small slit and taste for bitterness. Cut into 1 & 1/2 inch slices (refer to photo above). Make a slit to the halfway point from one end of each slice to make room for stuffing. Fry besan in a pan with 1 Tsp of oil. Let it cool. Add remainder of the ingredients and mix together. 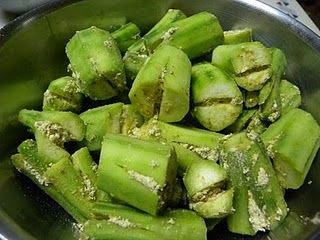 Fill fried besan with masala mixture into the slits on the end of each slice (refer to photo below). Heat the oil in a wok (or large skillet with cover) on medium heat. Add filled turia to the wok or pan. Cover and let cook for a few minutes and then flip with wooden or plastic spatula. Add remaining masala on top and let cook for two more minutes. Garnish with Cilantro and Coconut Powder. Growing up as a vegetarian, I consider myself lucky. Honestly, I had no idea what it was like to eat meat. My family followed the Jain Religion, so we believe in leaving less of a carbon foot print in the world. For centuries religious and scientific theories have come and gone. But the necessity of a healthy diet has always remained a constant. Many people today still argue that meat has more protein value compared to a vegetarian diet. However, research shows that eating healthy is vital for all us. We are surrounded by an abundance of food. Our supermarket culture is growing so we have plenty of food but we still find ourselves nutritionally poor. We have lost our way to healthy living. Even though vegetarian food sounds whole, healthy and fresh, one still needs to take care when making food choices. We should watch our eating habits. The body should be provided with healthy and wholesome foods, pure and untainted by blood or negative vibrations. We should feed our body with those foods which involves minimum violence. This universe is made of two things: Living and Non-living. All life is bound together by mutual support and interdependence. One who neglects the existence of the elements, earth, air, fire, water and vegetation disregards his own existence. We should not harm and kill other living things for our own greed and possession. All lives are interconnected so if we harm ONE we harm All Living beings thus it creating an imbalance in the environment. These are ancient statements from the Jain Religion, but they still influence the modern science of ecology and the concept of a green world. This philosophy is refreshing, contemporary, and promising. Our industry has been so successful that today meat costs more than vegetable dishes in restaurants. According to PETA, one American over a lifetime consumes 21,000 animals. I am happy to see changes around us. Celebrities are beginning to realize the implications of consuming so much meat and are trying to improve the numbers. Many are beginning to eat less meat and call themselves Flexitarians. Famous chefs Mario Batali is among them. He now offers more vegetarian portions and has started Meatless Mondays. He is also planning to open strictly vegetarian restaurants. More and more celebrities like Paul McCartney are going for green. PETA is a great example of an organization trying to get people to eat less meat. You may ask why kill vegetables? A big argument always rises. A person has to kill so many vegetables to be well fed, but could feed many people with only one animal. It is not only harmful to your health and the environment, but it is also pretty boring to cook meat alone. Veggies have more natural flavor plus healthy nutrients and anti-oxidants. For anyone who has seen animals suffer, this is a glimmer of hope to reduce their suffering. Recently, I read an article in the New York Times about a famous place for Sabudana Na Wada near Mumbai, India. One small, local shopkeeper has perfected recipe to the point that, so far, no one can duplicate it. This has been one of my favorite foods since my childhood. Usually, I avoid making this bhajia because the starch content is very high, but it is still very, very tasty. One such day I received some as a treat from my cousin's mother. I loved so much that I thought I should share the recipe with my readers. Traditionally this is a faral food. People fast on these days usually do not consume grains of any kind. "Sabu" means "sago dana" which means pearls. In Africa and some of the parts of world sago is eaten day to day. In Brazil I have tasted sago pancakes for breakfast. It is used in Tapioca also. Just cover Sabudana with water in a bowl and soak for one hour. After an hour, spread it on a towel so any excess water will drain. Boil the potatoes and then mash them. Mix boiled potatoes, sabudana, ground peanuts, and spices. If the consistency is right, it will form a dough. It should make almost 10-12 balls. If it does not form into balls, pieces of bread can be added (but then it is not gluten free). You can also add a little rice flour. Roll the balls into rice flour and deep fry them in vegetable oil at medium heat.